I’ve been really looking forward to Samantha and Adam’s summer Palm House wedding. They are such a lovely, relaxed couple and the Sefton Palm house is, without doubt, one of my favourite Liverpool wedding venues. It’s impossible to get bored of photographing weddings here because both the Palm House and surrounding Sefton Park change throughout the seasons. Samantha got ready at the house of her maid of honour, in Aigburth. They had a chilled and relaxed morning together getting their hair and makeup professionally done. Once their hair and makeup was finished, it was time to get into their dresses. Once Samantha was in her wedding dress. I took a quick couple of bridal portraits before heading to the Palm House to catch up with Adam. It was busy outside the Palm House because the weather was beautiful. Adam and one of the groomsmen swap notes. A nervous Adam waits for his bride’s arrival. Whilst Adam waited in the Palm House, I made my way out to capture Samantha and her bridesmaid’s arrival in a cool vintage VW camper van. Samantha and Adam’s first look. One of the things I love most about summer weddings in the Palm House is the great light. There is always lots of it and it’s naturally on the right side at this time of day. It gives people that lovely little kick of light from behind that separates the couple from the dark foliage. Its, simply great for wedding photography. Another reason I love shooting weddings at the Palm House in Sefton Park is the Liverpool Registrars. They are some of the friendliest in the country so I’m able to capture every moment unhindered. I always think it’s important to capture the parents and other guests during the ceremony. I love everyone’s happy faces in this picture. Liverpool registrars are good fun too, no boring ceremonies here. A proud father and mother of the bride watch Samantha and Adam exchange rings. Everyone wants to capture a great shot of the happy couple walking down the aisle. It was great to see Samantha and Adam spend so much time together. Here they are sharing a moment just after the ceremony. Only organic confetti and petals are allowed outside the gates of the palm house. I love photographing confetti, it’s such a fun moment. 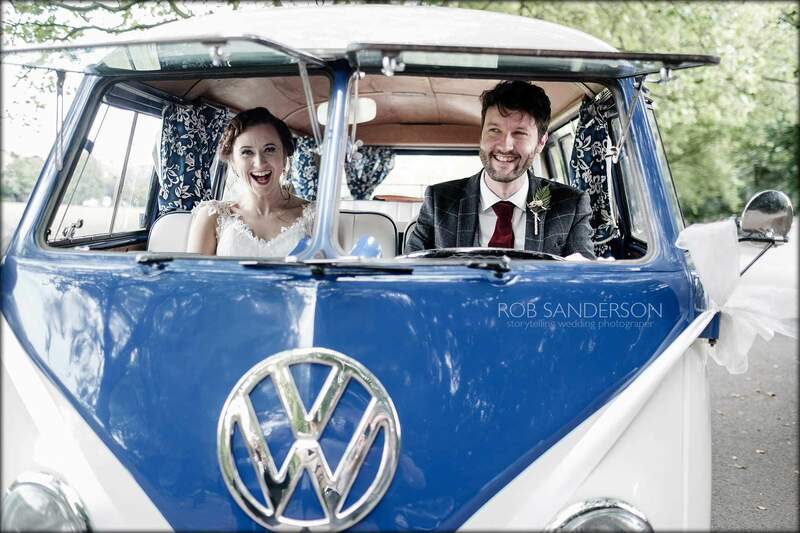 After the confetti, Samantha and Adam went for a spin the camper van and I couldn’t resist tagging along. I just left them to enjoy the ride while I captured a few candid moments for them. Summer Palm House weddings. Once we got back to the park, I took a few quick posed pictures with the VW. I’m always happy to take a few stylish group pictures. And all too soon it was time for the speeches. Here are a few classy couples portraits I took during a quick 20-minute session. I work fast, so as not to take you away from your guests for long. No summer Palm House wedding is complete without a trip to ‘Fairy Wood’. Then I left them to enjoy the rest of their day. It’s often still light for the first dance at summer Palm House weddings. Even Adam wanted to take some pictures! The Palm house all lit up at night is quite a spectacular sight. Click this link if you’d like to know more about Palm house weddings and my wedding photography.